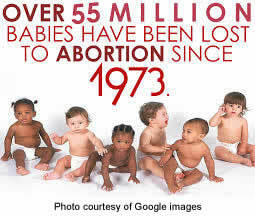 Since Roe v Wade, more than 55,000,000 children have been denied the right to life, the most fundamental of rights guaranteed by our constitution and according to the founding fathers of our nation as stated in the Declaration of Independence, unalienable, which means, never to be taken away. And this most fundamental right is endowed by our Creator, God, whom you claim belief in according to your own admission. Science has since that time, more than adequately proven that a living, fully human and unique individual exists at the moment of conception. Based on this fact, Roe V. Wade should be overturned since unborn babies are in fact, persons who are guaranteed the right to life by our constitution. As a fellow Christian, having reviewed your voting record as it pertains to abortion and reproductive rights, I am compelled to remind you of certain tenets of the faith that we share since you advocate so strongly for abortion. First, God hates the shedding of innocent blood (Proverbs 6:16-19). God cannot be pleased with how callous His people have become about the willful destruction of human life, life that He created in His own image. I cannot imagine that He will not count it against you on judgment day. Second, although you are not actually committing the act and carrying out abortions yourselves, you and others not only condone the act but you provide the funding and the means to do so (Romans 1:28-32). In light of the Holy Scriptures, the absolute authority for the faith that we claim, I ask you to reconsider your position on abortion and instead, advocate for life. Rather than provide millions to Planned Parenthood and other pro-abortion organizations, promote and fund adoption and other pro-family organizations that support traditional marriage. It’s time you take your faith seriously! Please feel free to copy and paste this letter into your own word processing document, sign your name underneath mine (please, no other changes to the letter) and email it to your representatives.